This web page contains thorough information on how to remove Veciti Derbi Patch 2013 / PESEdit.com Patch 6.0 – Pro Evolution Soccer 2013 version 6.0 for Windows. The Windows release was developed by soul_eclipse. You can read more on soul_eclipse or check for application updates here. More information about the app Veciti Derbi Patch 2013 / PESEdit.com Patch 6.0 – Pro Evolution Soccer 2013 version 6.0 can be found at http://www.peseditblog.com/. Veciti Derbi Patch 2013 / PESEdit.com Patch 6.0 – Pro Evolution Soccer 2013 version 6.0 is commonly installed in the C:\Program Files (x86)\KONAMI\Pro Evolution Soccer 2013 folder, subject to the user's decision. The full command line for uninstalling Veciti Derbi Patch 2013 / PESEdit.com Patch 6.0 – Pro Evolution Soccer 2013 version 6.0 is "C:\Program Files (x86)\KONAMI\Pro Evolution Soccer 2013\unins000.exe". Keep in mind that if you will type this command in Start / Run Note you might be prompted for admin rights. The application's main executable file is titled PESEDIT.exe and occupies 183.00 KB (187392 bytes). The following executables are installed together with Veciti Derbi Patch 2013 / PESEdit.com Patch 6.0 – Pro Evolution Soccer 2013 version 6.0. They take about 20.24 MB (21217953 bytes) on disk. The current page applies to Veciti Derbi Patch 2013 / PESEdit.com Patch 6.0 – Pro Evolution Soccer 2013 version 6.0 version 6.0 alone. When you're planning to uninstall Veciti Derbi Patch 2013 / PESEdit.com Patch 6.0 – Pro Evolution Soccer 2013 version 6.0 you should check if the following data is left behind on your PC. 2. Start Advanced Uninstaller PRO. It's recommended to take your time to get familiar with the program's interface and wealth of tools available. Advanced Uninstaller PRO is a powerful PC management program. Star rating (in the lower left corner). This tells you the opinion other people have regarding Veciti Derbi Patch 2013 / PESEdit.com Patch 6.0 – Pro Evolution Soccer 2013 version 6.0, ranging from "Highly recommended" to "Very dangerous". The uninstall string is: "C:\Program Files (x86)\KONAMI\Pro Evolution Soccer 2013\unins000.exe"
7. Click the Uninstall button. A confirmation dialog will appear. accept the uninstall by clicking the Uninstall button. 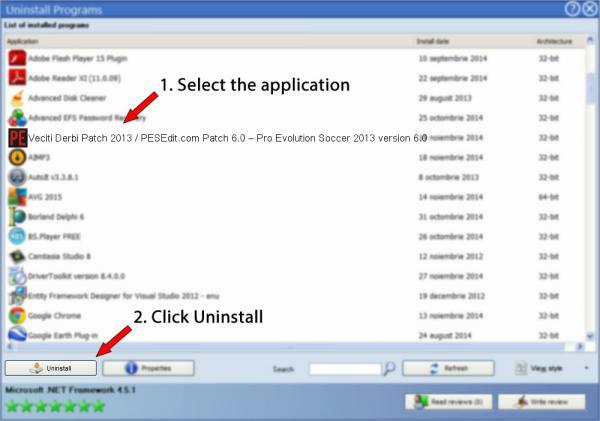 Advanced Uninstaller PRO will then remove Veciti Derbi Patch 2013 / PESEdit.com Patch 6.0 – Pro Evolution Soccer 2013 version 6.0. 8. After uninstalling Veciti Derbi Patch 2013 / PESEdit.com Patch 6.0 – Pro Evolution Soccer 2013 version 6.0, Advanced Uninstaller PRO will offer to run an additional cleanup. Press Next to go ahead with the cleanup. All the items that belong Veciti Derbi Patch 2013 / PESEdit.com Patch 6.0 – Pro Evolution Soccer 2013 version 6.0 which have been left behind will be detected and you will be able to delete them. By removing Veciti Derbi Patch 2013 / PESEdit.com Patch 6.0 – Pro Evolution Soccer 2013 version 6.0 using Advanced Uninstaller PRO, you can be sure that no Windows registry items, files or folders are left behind on your disk. This page is not a recommendation to remove Veciti Derbi Patch 2013 / PESEdit.com Patch 6.0 – Pro Evolution Soccer 2013 version 6.0 by soul_eclipse from your computer, we are not saying that Veciti Derbi Patch 2013 / PESEdit.com Patch 6.0 – Pro Evolution Soccer 2013 version 6.0 by soul_eclipse is not a good application for your PC. This page only contains detailed info on how to remove Veciti Derbi Patch 2013 / PESEdit.com Patch 6.0 – Pro Evolution Soccer 2013 version 6.0 in case you want to. Here you can find registry and disk entries that our application Advanced Uninstaller PRO stumbled upon and classified as "leftovers" on other users' PCs.